We’ve already seen numerous designs for weird and wonderful console controllers, but Sony’s latest, for a 3D, ultrasonic PS3 controller, really takes the cake. Sony Computer Entertainment America’s patent application is entitled: “Determination of controller three-dimensional location using image analysis and ultrasonic communication.” Put simply, it’s inked plans for a controller that communicates with the PS3 and PlayStation Eye, over various connectivity technologies, to control games. Further description of the unit seems to indicate how two controllers can be slotted together – as shown in the image below – or be used as single units in a multi-player game. Could a lightsaber game be en-route to the PS3? 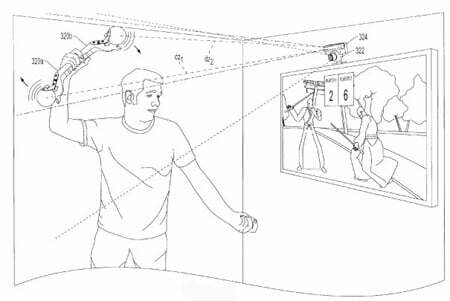 The position of one or more controllers can be tracked in “three-dimensional space using hybrid video capture and ultrasonic tracking system”, according to the patent. For example, the ultrasonic side analyses sound communications to determine the distances between the PS3 and each controller, and the relative distance between each controller. Video capture, on the other hand, is used to identify a horizontal and vertical position for each controller. There’s also mention of Wi-Fi connectivity directly with the PS3. No indication’s been given of whether Sony actually plans to commercially develop the controller. But drawings do show how it could be used to direct the actions of a lightsaber-wielding character.